Bob compiled these pages on landscaping products and materials to answer questions about landscape basics. How is shredded mulch made? GARDEN SOIL... SOIL OR DIRT? The old joke goes that soil is what you grow plants in and dirt is what's under your fingernails. During several Pennsylvania winters, Bob taught adult-education Landscaping classes. Bob's students always felt that way too much time was spent on soils. But Bob's curriculum never changed. Because everything begins with the soil. Once you understand the basics of soil science and begin to apply what you've learned, plants will start to grow much better for you. Hopefully, this page and its links will teach you the basics of soil science. Even though these pages specifically address soil conditions in Southwestern Pennsylvania, much of the material here also applies to soil everywhere. Soil is loaded into the hopper on the right where it is shredded into smaller particle sizes. It then travels up the conveyor belt into a rolling screen. The "shredded and screened" soil falls into a pile below for sale by the ton or cubic yard. The discarded soil and debris travels out the open end of the screen barrel down the chute into a discard pile to be sold as "fill dirt." Therefore, 50% of the average soil profile is "pore space" (25% air + 25% water = 50% pore space). It's this pore space where plant roots actually grow. Think about it: Plant roots actually grow "between" the soil, not "in" the soil. It's the pore space that gets reduced when soil is compacted. Everyone knows heavy equipment can compact soil, but most people don't think about how much compaction can occur from ordinary foot traffic, such as on a golf green. Compaction is an ongoing problem on athletic fields, especially if fields are used when the soil is wet. Soil is classified by particle size, with sand being the coarsest and clay being the finest. Pittsburgh soils tend to be predominantly clay. Clay soils have the "bad rap" since they can exhibit poor drainage characteristics. However, clay soil has good nutrient-holding capability (a high C.E.C.) and will hold moisture much longer than sandy soil. Most eastern U.S. subsoils are 70% clay. The combination or arrangement of the primary soil particles (sand, silt, clay) into secondary particles ("units" or "peds"). Rototilling soil that is too wet breaks down soil structure and causes a crusted surface. Do not rototill wet soil. The activity of Hydrogen ions in the soil determines its pH as being either acidic, neutral or alkaline. Rainfall (H2O) in S.W. Pennsylvania continually introduces Hydrogen (H) ions into the soil solution, causing soil to revert back to an acidic condition. This is why soil should be tested every 3 to 5 years to determine its changing needs for lime. Most soils we have tested in Washington County and Allegheny County range from pH 5.5 to 7. Unless "acid loving" plants are growing in these areas, agricultural lime is used to raise the soil pH into a better plant growing range. Never rototill or "work" soil when it is too wet! Tilling wet soil will ruin soil structure and result in the formation of hard clumps. Always allow time for your soil to dry enough for proper cultivation. When tilling the soil, don't overdo it. It is best not to rototill the soil into a powdery consistency since it destroys soil structure. Heavy clay soils can be improved by working in organic matter. (See soil amendments webpage for more information) The addition of lime (if needed) or gypsum, will also help improve "heavy" soils. Correcting your soil pH will "unlock" nutrients which are already present in the soil, and help maximize dollars spent on fertilizer. 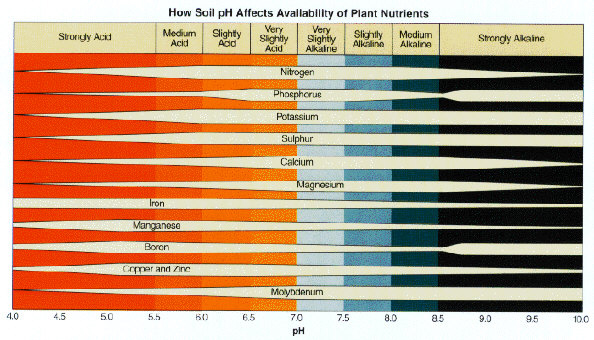 Some chemicals move very slowly down through the soil profile, and should be mixed-in with the soil at planting time. These include phosphorus and calcium.